Included is a Tubular Mortice Latch, and a pair of Escutcheons in Satin-Chrome. The 5000 series is designed for medium to heavy duty applications. It has full size lever handles with rubber soft grip inserts and a large 10 digit keypad. This enables the 5000 to control access in a wide variety of applications including DDA. Other key features include, clutched handle which protects against forced entry and lock damage, optional free passage function, and 8mm square-drive spindle so it can operate a wide range of panic devices or a sash-lock (to be purchased seperately). There are also back to back versions (5050 & 5051) i.e. 2 keypads where controlling access is required on both sides of the door, as well as a knob version specifically designed for outward opening doors and where misuse is expected. There are 4 finishes and 4 handle designs available. 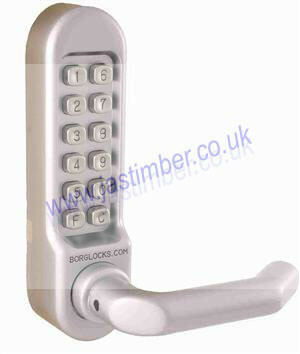 This Borg Digital Lock with Handles is available for £100.00 (+vat).